The class sizes have been limited to 24 students. We understand that life happens and in order to prepare for unexpected changes, we have come up with the following cancellation policy. There are no refunds, credits or exchanges offered on any deposits, partial or full class payments. If you cannot attend the retreat it is up to you to sell your spot and contact us to let us know of your replacement. Your registration is transferrable to someone else. Please note that it is up to YOU to find a replacement and arrange for payment. Please contact us with their name, email and other contact information so that our records are up to date! 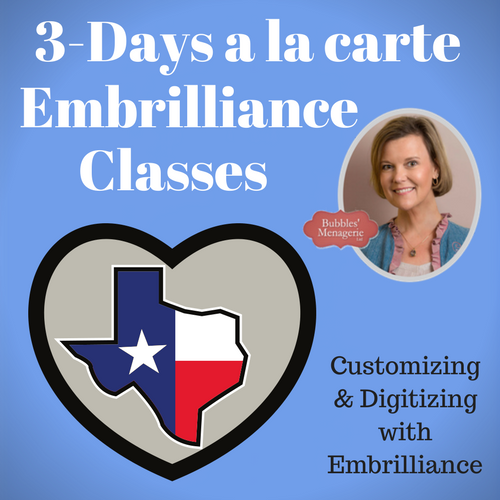 In order to register for Day 3 only, you must already own and be familiar with SA2 or SA3 or have digitized in another software or have already taken a hands-on class with Lisa Shaw. This is subject to cancellation and a $25 fee if you register and do not meet the requirements – so please ask questions ahead of time. Bubbles' Menagerie© 2019. All Rights Reserved.